Churchill’s Secret, co-produced by PBS Masterpiece and ITV (UK). Directed by Charles Sturridge, starring Michael Gambon as Sir Winston and Lindsay Duncan as Lady Churchill. PBS and ITV have succeeded where many failed. They offer here a Churchill documentary with a minimum of dramatic license, reasonably faithful to history (as we know it). Churchill’s Secret limns the pathos, humor, hope and trauma of a little-known episode: Churchill’s stroke on 23 June 1953, and his miraculous recovery—while for weeks his faithful lieutenants secretly ran the government. To paraphrase Dr. Johnson, the film is worth seeing, and worth going to see. Exactly how ill the Prime Minister really was I leave to experts, but many close to him thought he would die. Colville wrote: “he went downhill badly, losing the use of his left arm and left leg.”2 In the film, Moran (Bill Paterson) is urgently summoned to Downing Street, where he finds the PM singing incoherently: “I’m forever blowing bubbles.” Great heavens, I thought, they are going to link this to Marigold…. “Bubbles” was the favorite song of a 2 1/2-year-old daughter who died in 1921. Rarely mentioned, Marigold was buried in a corner of their hearts. With poignant flashbacks, the film unfolds their memories of the tragic loss they still deeply felt. In a moving scene, Clementine tearfully recounts Marigold’s story to her husband’s nurse. As a device for portraying her and Winston’s humanity, this is a touch of genius. The nurse, Millie Appleyard (Romola Garai) is the film’s only fictional character: meant to represent “the help”—too numerous to catalogue in the space of a short film. Millie has a Yorkshire accent but her father, she tells Churchill, was Welsh: “and no fan of yours.” (WSC reluctantly allowed deployment of troops during the Welsh miners strike in 1910.) Devoted to his recovery, but always her own woman, Millie sees the job through, confronting all challengers—a perfect foil for Churchill, his wife, and their sometimes obstreperous family. Critics who say PBS overly dotes on British drama, from Upstairs Downstairs to Downton Abbey, forget that UK theatre has unequalled depths of talent. There are so many exceptional actors that casting lookalikes for a historical film is a relative breeze. In Churchill’s Secret, the casting is superb. 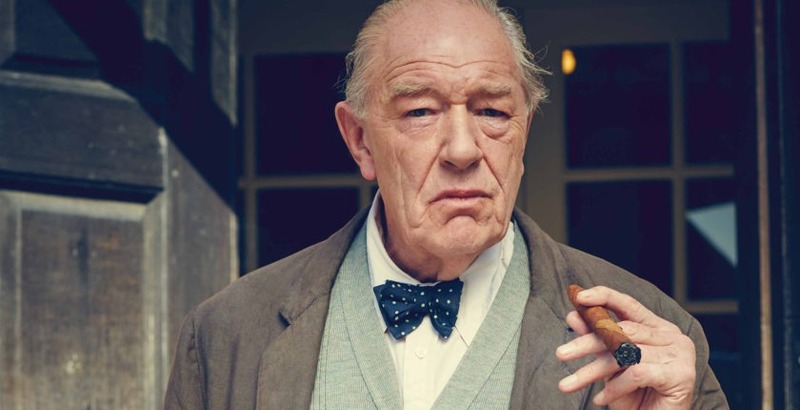 Michael Gambon is an excellent Churchill: more drawn, less cherubic, but perfect in his mannerisms and bearing. One soon stops seeing Gambon and begins seeing WSC. Lindsay Duncan as Clementine is almost up to the standard set by Vanessa Redgrave, brilliant alongside Albert Finney’s Churchill in “The Gathering Storm” (2002)—and far superior to Sian Phillips, the great Robert Hardy’s opposite number in “The Wilderness Years” (1981). The producers could have spent less time on the angst of Churchill’s progeny, and more on how Colville and Soames held the fort (symbolic of a larger staff, which included David Pitblado, Anthony Bevir, and personal secretary Anthony Montague Browne).3 Churchill wrote a famous article, “What Good’s a Constitution?” In 1953, they must have asked themselves that question. …the administration continued to function as if he were in full control. We realised that however well we knew his policy and the way his thoughts were likely to move, we had to be careful not to allow our own judgment to be given Prime Ministerial effect. To have done so, as we could without too great difficulty, would have been a constitutional outrage. It was an extraordinary, indeed perhaps an unprecedented, situation…. Churchill’s Secret is replete with Sir Winston’s famous admonition in the face of misfortune, K.B.O. (Keep Buggering On). Amid growing calls for his retirement, he was determined to stay—long enough at least for one more try at his final goal: a permanent peace. The film is not clear about how much time elapsed between the stroke and the “test” Churchill set for himself. That was the Conservative Party Conference at Margate, where on October 10th he would have to make a major, fifty-minute speech. It was do or die: We are rushed through the weeks to Margate, actually almost four months after he was stricken. Some keen observers have faulted the portrayal Clementine in Churchill’s Secret—not for Lindsay Duncan’s skillful acting, but for the words the script has her say. To some she seems a whiny, self-centered neurotic, the very picture given in recent biography. 1 John Colville, The Fringes of Power: Downing Street Diaries 1940-1955, 2 vols. (Sevenoaks, Kent: Sceptre Publishing, 1986-87), II 329. 3 Montague Brown’s memoir, Long Sunset, scarcely mentions the episode; it should be remembered that at the time he was very new to the job, having only been seconded to Churchill (by the Foreign Office) the previous October. 5 Mary Soames, Speaking for Themselves: The Personal Letters of the Churchills (New York: Doubleday, 1998), 570. 6 Colville, Fringes II 341. 7 Soames, Personal Letters, 570.